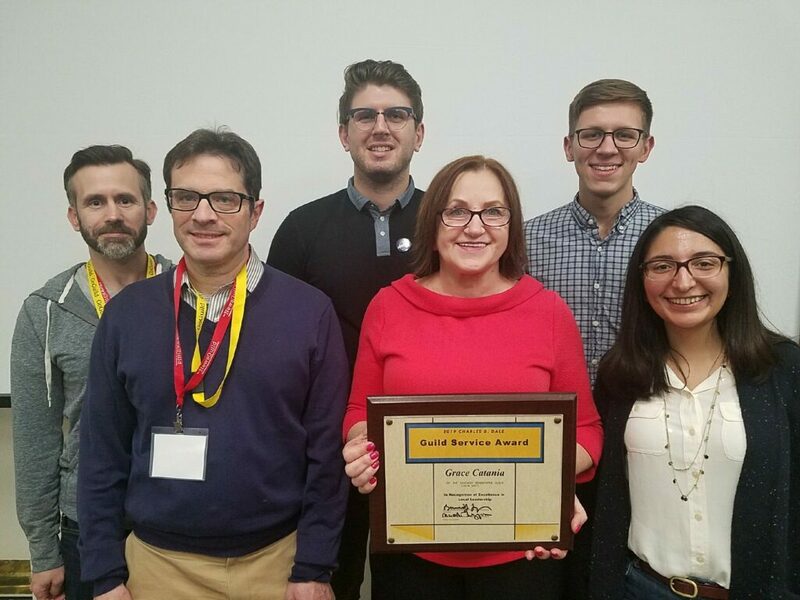 At the 2019 NewsGuild sector conference in Orlando, Chicago News Guild President Grace Catania received the Charles B. Dale Guild Service Award in honor of her tireless work in her union. CNG members are grateful to Grace for the continued leadership, advocacy, and passion she brings to our union as president of our local. Gratulacje, Grace! “It is with great enthusiasm that I nominate Chicago News Guild President Grace Catania for the Charles B. Dale Guild Service Award. In July 2016, Guild staff and Grace were able to recruit union investors to back the purchase of the Chicago Sun-Times and Reader, likely saving dozens of Guild jobs at the two publications. The Guild was able to sway the Justice Department to intervene in a proposed sale to our largest competitor, pulled together an investment group that included some of Chicago’s largest labor unions on a tight timeline— raising more than $11 million in an unprecedented deal that should be a model for struggling newspapers across the nation. That huge achievement was followed a year later with a wildly successful organizing drive at the Tribune, which will add some 300 members to the Guild, and give voice to employees who have for years worked long hours, often going years without raises, and enduring the whims of increasingly off-kilter management. Grace, who rose into Guild leadership from the ranks of the Cook County court interpreters, was an ardent supporter of these two newspaper-centric efforts, despite the fact that her own local faced decimating job losses after county budget cuts. Those staff reductions that never happened in large part because of Guild lobbying of county officials to preserve the essential role of translators in the county justice system. Grace provided steadfast leadership and support to Guild staff and members of her own local— despite the fact that she was one of the workers who received a 30-day notice when the budget cuts were announced. It’s worth noting that after the Janus ruling allowed any member to stop the dues deduction from their paychecks, Grace’s unit lost only four members, a tribute, I believe, to the hard work by Grace and the Guild to preserve their jobs. But beyond these noteworthy, even historic developments, Grace’s contribution to a renewed energy in Guild operations cannot be understated. Grace herself is a tireless volunteer to Guild activities and her boundless enthusiasm for the Guild and labor causes is contagious. Grace has twice hosted gatherings for members at her home, and is always looking to get Chicago Guild members to join her at rallies and marches across the city. Under her leadership, the Guild last year convened a committee to revamp our communications among the membership, and has committed each year to seeking out members with leadership potential and sending them to training. Last month, the Chicago Guild hosted stewards for interested unit members, the first time I can recall our local offering such training. It is obvious to any one who knows her that Grace regards our local as a family, and her compassion for members and staff is one of the reasons she is such a great motivator. Attendance at our monthly board meetings has increased during her term as president, not least because meetings are moving more quickly— and possibly because Grace herself prepares meals for everyone who attends. Grace and her husband this summer hosted an Executive Board meeting at her home. She regularly pressures me, as treasurer, to find money to pay for social gatherings for members, arguing (correctly) that the personal connections between workers are what make us stronger as a union. With motherly warmth, she is forever scolding our executive director, Craig Rosenbaum, to straighten up the Guild offices and improve his diet. Well done & Congratulations Grace. Congratulations, Grace; you’re a powerhouse, and you deserve this!